A special pod which is compatible with the RF coils is provided to hold the baby safely within the magnet. MR compatible vital signs monitoring is included and both visual monitoring and emergency access are excellent as seen in the image above. The system is so quiet there is no need for hearing protection and the SAR is also so low as to be insignificant even for very low weight premature babies. Over 600 studies have been safely carried out without use of sedatives or general anaesthetics at the NICU in Sheffield, UK. Research studies have shown that the system can provide up to 50% more diagnostic information than 'gold-standard' ultrasound*. 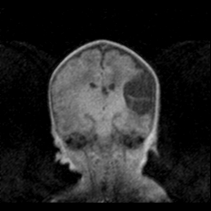 A complete solution for neonatal MRI. Isn't it time to provide your neonates with the best diagnostic tool available? * Whitby E et al. The Lancet, 2004. * Imaging the CNS of the Fetus and Neonate, Eds. Griffiths P, Paley M, Whitby E, 2006, Taylor-Francis.